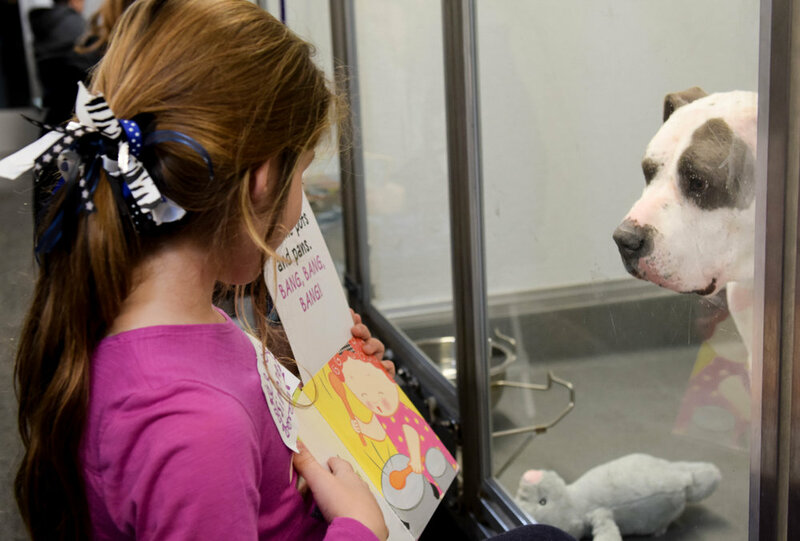 The benefits of reading to shelter dogs have long been praised by educational programs and rescue organizations alike. Wags Kids! is proud to announce the launch of our very own reading program, Paws and Pajamas, hosted bi-monthly at our adoption center. Children ages 6-12, and their parent or guardian, are invited. Pre-register to reserve a spot for a designated Saturday morning. Wags Kids are encouraged to bring a favorite book or two from home, or can choose from our library of beloved dog books. After a brief safety orientation and mini-lesson facilitated by our Educational Director, Mikayla Park, your child will read to one of our Wags Dogs in our beautiful facility. Parents/guardians may join their child for reading time, or join us for coffee, tea and light snacks in the lobby. *Pajamas welcome. Close toed shoes required. One reservation per child. Parent/guardian must remain on the premises for the entire program. Thank you for not bringing unregistered siblings / guests. Space is limited. Questions, comments or to just connect, please email kids@wagsandwalks.org.